this is not my new year's resolution, but i really need to note down my japan trip last year... before my next trip planned for april this year. so here's my rambling thoughts. thanks to the weather, my memories of all the places that we went to were all picture-perfect. clear blue sky and long white clouds. apart from the heat, it was all great. so the trip started in kyoto, where enjoyed authentic japanese food, kyoto style. especially the very famous locally grown veges. the ones you see at nishiki market are perfect examples but minus all the preparation work. japanese people are so serious about presentations. everything looks so perfect and artistic. all the basic points are skipped here, you can find gazillions of books/articles written about the wonderful old capital of japan. let's not bore you with repetitive information. before our nara trip, there was a stopover in fushimi inari and took an unusual route where nobody did. it was such an amazing walk. tiring, yes. but you got to see the residents in the local mountains. the old little shops, the lazy black cats lying on the floor under the sun. the polite postman passing by on a bike, the beautiful wild flowers in between tombstones. it was well worth the effort and energy even though we got so exhausted. since then, we started taking "unusual routes" to avoid big crowds of tourists. when we arrived in nara by train with big suitcases, it still didn't get much cooler, didn't feel one bit like we were in autumn already. the weather was so fine that i could just lie on the bench to get roasted for the rest of the day. we hopped on our rented bikes and began our adventure. riding bikes was all new experience again. the last time that i rode bikes was in paris with my friend along shadowed avenues by the musee rodin in chilly autumn 2 years ago. the uphill ride wasn't easy but we were running on a tight schedule as we just left kyoto and would be leaving for wakayama the same night, we didn't have too much time planned for nara. all we wanted was to see the deer and feed them senbai. kasuga taisha was tucked away in a very quiet area, although still popular among tourists, it attracted much fewer foreigners. as we were being super impressed and having fun taking pictures of a gigantic tree, there was an old man talking to us. he then led us to the back of the shrine, moved aside the dangling vines and leaves, showed us something that's really cool. stone lanterns made of marbles! 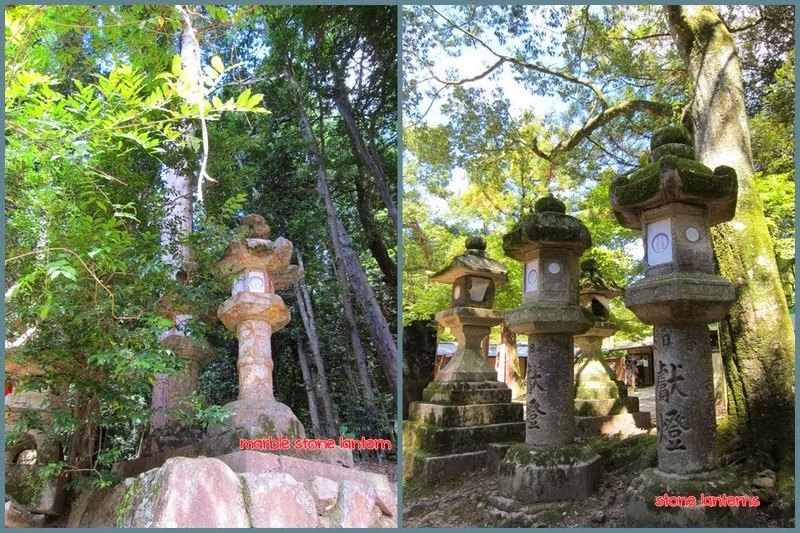 we were told that these were only original marble stone lanterns made in the old times left in japan. all these good marble ones were taken away to tokyo by the rich and famous. these were the only old and originals left, now hidden behind big tall trees. nobody would ever see them if it wasn't because of the guy. this was such a wonderful story from him and we even got to know what the gigantic tree was! yes, i asked if we could take the twigs home with us. and now it's safely tucked away, hidden among my books. 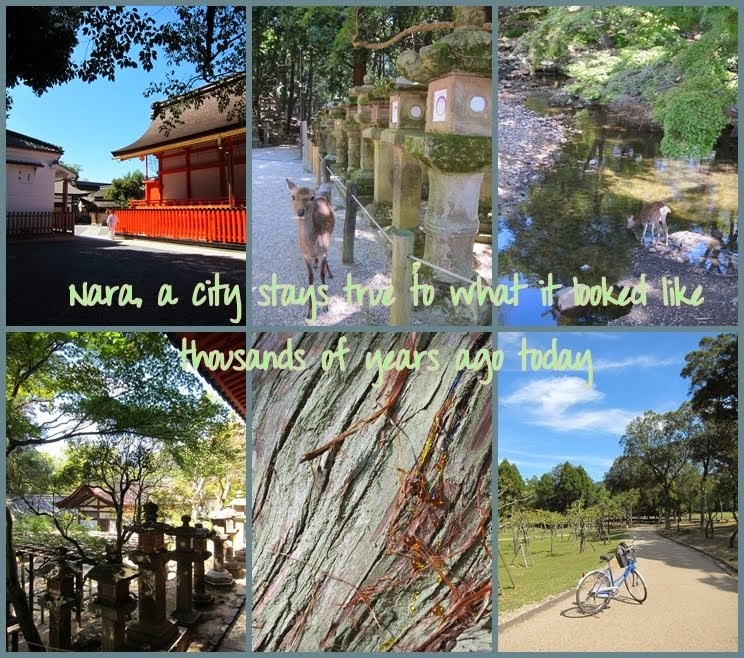 this was the first couple of cute stories happened in nara. oh, did i forget mentioning my map got eaten by a deer? i was trying so hard to take it back, but was so scared of the aggressive animal. and in the end, a laughing foreigner took a picture of me, trying to pull a half-eaten map out of a deer's chewing mouth. NOT a pretty picture. NO.